A couple of old friends take a walk past recently turned Sumac. 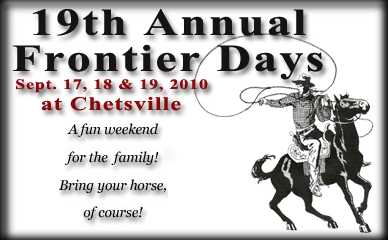 Dust off your boots and grab your hat for a Western Weekend of Family Fun at Chetsville! Live music all weekend by Coal Town Rounders, Hitchin Cricket, Del Rain, Band of Gypsyz, and on Sunday afternoon Old Friends. Grilled food and good eats, on Friday night grill a steak over an open fire; hot breakfast buffet on Sat. and Sun. mornings from 8 to 11a.m. Pig Roast on Sat. afternoon, and Chicken BBQ on Sun. afternoon. 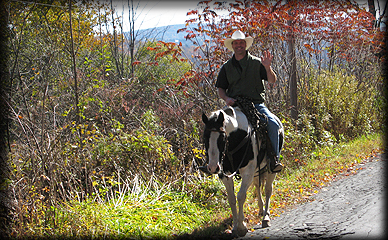 Fun and games – horseshoes, the nail game, carnival games, volleyball and mechanical bull riding. Visit the Shirt Shop for hats, shirts and more. Admission fee: daily or weekend.